A great day out traversing mountains, popping in to a different country and skiing a delightful new line with Bjorn. 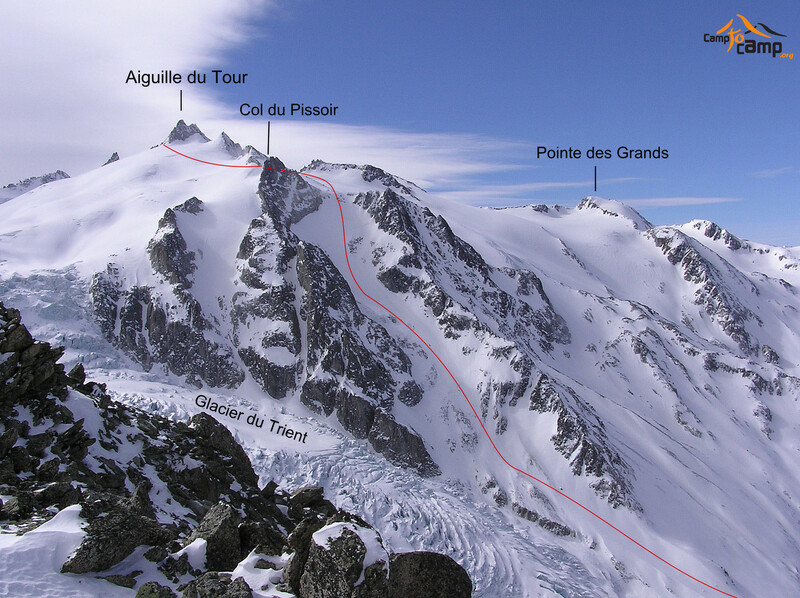 Top of Grands Montets, ski down to the glacier d’Argentiere, up and over Col du Passon, followed by a traverse of the Glacier du Tour, up and over the Col du Tour into Switzerland, then underneath Aig. du Tour and down over the col du Pissoir got us to the top of this delicious line. A plane landing on glacier du Tour. Are we in Alaska? Björn dropping in to col du Pissoir, high above the Swiss village of Trient. The entrance to Couloir du Pissoir is ahead on the right. After a steep entrance, the couloir opens up. For a little over 1000m ascent, you get almost 3000m of down. I enjoyed exploring new terrain and will certainly be back to this area again in the future. With the lack of resort snow at the moment in Chamonix, people are exploring further afield and discovering new lines. What’s not to like? Thanks for the day Björn, and thanks to the Austrian couple who gave us a ride back to Chamonix!